This is a comment posted on the public Facebook page of the Meitiv’s Montgomery County Councilman at large. He has since taken it down. What’s wrong with spreading gossip? 2 – It implies that if someone doesn’t agree with another parent’s childrearing practices (and who ever does? ), this is reason enough to consider them legally suspect. 3 – It turns neighbors into the secret police. 4 – It turns an old-fashioned childhood — kids “wandering” around the neighborhood! — into neglect. 5 – It turns all of us against each other. If the neighbors are concerned for the kids and see them all the time, that means that there IS a neighborhood of people looking out for each other. Why not celebrate that instead of turning it into character assassination of the parents? 6 – There is nothing wrong with kids being outside, unsupervised, with their parents’ permission. It may be unusual to see kids outside now, but that is because we have become so convinced that if children are not supervised, monitored, or kept indoors 24/7, they are in immediate danger. That is simply not the truth. Kids have always spent a portion of their childhoods away from direct adult supervision, and it is only at this one, odd, trembling moment in time that we have become convinced that the Evil Eye is waiting to pounce the minute mom waves goodbye and the kids walk to the bus stop. We live in the safest times in human history, according to Harvard’s Steven Pinker. Crime is at a 50-year low in America. Most of our OWN happiest childhood memories did not occur when our moms and dads were right beside us. So remember the Free-Range Kids and Parents‘ credo: Children have the right to some unsupervised time, and parents have the right to give it to them without getting arrested. Or maligned. – L.
I’ve said it before and I’ll say it again. That family really needs to relocate away from Maryland. Yeah, we don’t want “that sort” living in the neighborhood. Lowers the property values. There’s something I believe is “off” about several families in my neighborhood. I just don’t call the cops about it. It also means that the Meitivs’ parenting style has been in practice “FOR YEARS” (cit.) *without any concrete issue arising from it*. As stated: it started when the children where much younger, it went ahead for years, and the children were perfectly fine. This sanctimonious comment made my blood boil. The neighborhood believes something is “off” about this family. Oh, really? As if Hans Reimer’s friend (who sounds like a lovely person, BTW, if he or she even exists) is the spokesperson for an entire neighborhood and as if the neighbors’ opinion of the Meitivs matter one iota in the larger issue: that this family was the victim of serious over-reach by the police and CPS. Ever since the story of Job, people love to judge and try to come up with reasons why bad things happen to people, usually by blaming the victim. The truth is probably too simple for people like Hans Reimer and his ilk to wrap their tiny minds around, but the Meitivs did nothing wrong. They allowed their children to do what millions of children have done since time immemorial, which was to be outdoors unsupervised in order to learn how to navigate the world with confidence and independence. Is that so difficult to grasp? Reimer took his comment down but the internet never forgets. I hope the attorneys representing the Meitivs take note of an elected official’s libelous statement about their clients and take proper action. If these kids have been wandering the neighborhood since they were “much younger” why is CPS getting involved just now? By much younger I would assume he’d mean 3-4 years ago, when the kids were maybe 6-7 and 1-2. I think most of us can agree that a 6-7 year old wandering an urban neighborhood with a 1-2 year old is usually negligent (the older child, sure, but definitely not “roaming the neighborhood” with a toddler in tow)- so why wasn’t CPS involved then? Children roam neighborhood freely for years, nothing bad happens. I thought the Meitivs had recently moved to that neighborhood? So that is probably a lie on top of everything else. And yeah, the kids *are* in danger – of mean people trying to bust up their family. Thanks a lot. In these stories, I end up wondering about what’s not being said, or other pertinent details being left off. Do the neighbors simply dislike the family due to their national origins? Do the neighbors themselves have children? Is the “neighborhood” perhaps just an island of an apartment buildling surrounded by superhighways and high-speed traffic? Is the neighborhood park filled with dope dealers and hormonal, knife-wielding teens? Is this a police vendetta? I can’t shake it from my head that it’s perfectly normal for a ten year-old to take his younger sibling to the neighborhood park at only three blocks away! I was walking alone to school eight blocks away when I was six. I live in the D.C. metro area, too, and I have noted my own surprise when I see kids younger than twelve walking by themselves or in groups. Seriously, you just don’t see it that often, and I can understand how the Meitiv’s neighbors, if they are unable to analyze their reaction, could transmute their sense of the kids walking alone being outside the norm into it being evidence of negligent parenting. That being said, I expect way more of Md. CPS. Hans would go absolutely nuts if he lived in the Philippines or Thailand or Nepal, etc., etc. and saw the way kids wander around the urban area in those countries WITHOUT incident and WITHOUT anybody calling the police. Don’t know if Hans is German (Isn’t “Hans” a German name?) or if he ever lived in Germany or when the last time he was in Germany but I do think that kids are much more free range over there than they are here in America. At least I THINK so. Any country seems to be more free range with their kids than the U.S. is. I live in an urban area which most people would consider to be “unsafe.” Yes there is crime, but there isn’t stranger danger child abduction because there is almost no stranger danger child abduction anywhere. Pretty young kids get themselves to and from school, either walking or on the public transit system above age 8 or so (there are rules about who gets an actual schoolbus and who has to walk or take transit depending on age and distance). I’m scared to death when my young nieces and nephews visit, because they live in the suburbs,are driven everywhere, and don’t have any sense about how to walk without wandering out into traffic, but this is not actually a difficult skill to learn. They just haven’t because they haven’t had to. The local kids do just fine. They’ve been doing it their whole lives. There’s something off about ME. You. Everyone. We’re not a homogeneous lot. You’re different, therefore you’re wrong is absurd. Even IF the children aren’t safe (and I believe they are perfectly fine), but even if hypothetically accept that these kids may be at greater risk, go to the parents directly. Talk to the kids, check on them yourself (you cowards). Better still – Mind your own business. The Meitiv kids are perfectly fine. Good grief. Let people live their lives. I worked at a property management company and parents of 20 and 25 year olds are making the first call to our office to rent an apartment, filling out and bringing in the application, paying the rent and security deposit and even doing all the cleaning when the kid moves out, almost inevitably leaving a huge mess and repair bill. The same with homework and jobs – the parents call in sick for their 20 year old – I am flabbergasted! This is where hovering over small kids goes when they become big kids. As for other countries, in Germany (where my family is from) it seems as though kids have more daily freedoms but home schooling is illegal there and that takes much of the parenting freedom away I think. I have a neighbor that I believe is a little “off” (a lot off really). I do tell my daughter not to go to his house when selling things door-to-door, but since he has never done anything criminal that I’ve seen, I don’t call the police on him. I find it “off” that the whole neighborhood sees the Meitivs in this way. I see them as completely normal parents, doing normal parental things. Considering that this was the norm for thousands of years, the way many paranoid parents think these days is what is very NOT normal. Unless children are literally snatched up by complete strangers, and they are getting hurt at an exponential rate, I will raise my own the same way I was raised. Which was “free-range”. Thanks for coining that term Lenore. We just called it childhood back in the day. Simply because that’s how almost every child was raised. Separates the two types of childhood these days. Free-range and Helicoptered. 🙂 It’s really sad how adults are so adamant against the normal childhood rearing, just so they feel better about themselves. And at the cost of their children’s physical and mental well being, both as children and their adulthood. What’s also disturbing, many of these helicopter parents, are the type of parents that as soon as their kids are 18 and older, they want them out of the house. Except they are now ill equipped to be out on their own. Terrible. These kids are then an example how after all these years they have remained “safe” with the exception of threats from neighbors and police. I assume by “wandering around for YEARS”, they mean letting kids stand in the sidewalk in front of their house, or even *gasp* walking to the corner of the block and back. 7) If there is a real problem, gossiping is not HELPING. I was in the car this morning and heard a great piece about the Meitivs on NPR where they interviewed Peter Gray. I expected no less from Gray, but it was refreshing to hear the same feelings expressed by the interviewer that playing outside without constant supervision is normal. I’m with Michelle. If you see something truly “off” (besides personal taste regarding parenting style) report it and do the community a favor instead of gossiping about it. I also wonder why he took it down. Did he get nasty replies or a call-out on professional behavior? And… I just checked out his Facebook profile. He now has a posted email about the events, and in the comments he says “In the future, I think it would be best to take these kids home to their parents”. Which is it? Let CPS kidnap them or take them directly home? Why not let them walk 2 measly blocks? Come to think of it, there’s something a little off about one of my neighbors, too! Their two kids are in their late 20s, early 30s, and still live at home with their parents! They even lived at home all through college. The mother complained to me that she didn’t know how she would ever get them to leave. Hmm. You think maybe if she had encouraged them to have more independence at a younger age, this might not be a problem now? Comment from “friend” it says. With friends like that, who really needs enemies! Funnily enough I spoke to a woman yesterday whose friend also lives in the neighborhood and says most people she knows are sympathetic and speculates that there is some poisonous disapproving neighbor with a grudge. Perhaps it’s the “friend” mentioned in the post above. The real problem is that in a atmosphere of hysteria people with crack post vendettas can be taken seriously. I have no idea if the Meitivs are odd or not but it doesn’t matter. It is not illegal to be a little off. You’re not the only ones experiencing this. We call it “Concern trolling”, aka sticking your nose into things that simply aren’t your business, like the way other people CHOOSE to raise their kids, by giving them responsibility. The Metivs, and their friends here, have far more friends than they know. . .
Tamara….I read an article somewhere, I think it might have been a link from this site, where a college professor noted that so many parents nowadays are accompanying their incoming Freshman kids to college orientation and registration. He commented that 40 years ago we would have been embarrassed to death if our parents accompanied us to these college orientation functions. But he said it seems to be the norm nowadays on university campuses or at least it’s not unusual. Doesn’t surprise me. How does anybody expect an 18-year-old kid to confidently go off on his own if he never did when he was in grade school or high school? So, reading between the lines…. We’ve been wondering who keeps calling to report these kids. I’m thinking it is Riemer’s friend. So the Meitivs have a nosy neighbor with a grudge against them, and this neighbor is chummy with a city Councilman. I am thinking this explains why the family has suffered so much from the government. John, it’s funny you should mention the parents accompanying their kids to freshman orientation. One of my college friends became more and more involved with the college administration and housing, and years after graduation still works at that same college. She says that now they had to add a “parent sendoff” ceremony to the official freshman orientation schedule to basically force all the parents to leave. When we went to that college, parents dropped you off and left and never attended any orientation events. With social media being what it is people feel they have the right to say whatever they want, that their opinions matter. Often these opinions only stir the pot and make matters worse. This is between the family and CPS, no one else. Gossip. Malicious gossip. Had the neighbor seen something wrong and called the authorities, the third party could crow to the councilman. But to spread gossip is never constructive, and sets a poor example for any children who may be listening. Hank Williams sang a great song called, “Mind Your Own Business”. There are times I realize how much the parenting of the 90’s led to where were are now. And when people (I assume gen-X) talk about college orientation, is one of those moments. There wasn’t a one of us who had been told to “come back when the streetlights came on.” We all had been required to state our plans so our parents knew where we would be, when we would return, and we were to call if there was any change in plan. Seems we got were were are now like a slowly boiled frog. My childhood was blessed with exploring, discovery, and real play, rarely were my parents beside me. It was a critical part of my childhood. I want my children to have the same opportunity. However, I have been made afraid to send my children outside by themselves. Not because of “stranger danger” or because I live in a bad neighborhood. Quite the opposite. I am afraid of my neighbors who gossip and have threatened to call the police on me because I let my 6, 9, and 11 year old run around the block. My wife and I have lived in the Silver Spring area since 1975. We have seen a lot of changes since then, mostly for the better. Forty years ago, downtown Silver Spring really was a bit sketchy, especially after dark. Now, post-urban renewal, it”s a far safer place. Specifically, since the establishment of a Montgomery County Community College satellite campus near the Meitivs’ neighborhood, it’s become a much more family-friendly place. As for Council Member Reimer, I’ll just say he’s a bit too fond of the nanny state for my taste. Some years ago, I spent a summer au pairing in Germany for a 6 year old and a 12 month old. School there starts at 6 yrs, in Sept, so the little girl was prepping for her first day at school. Prep included all the parents being called in ahead of time to remind them that the school expected their kids to walk to school, and that they should spend no more than 2 weeks making sure that the kids knew the route before the kids started doing it by themselves. It helps that all primary schools are walking distance from their catchment areas, and that the kids are that bit older, but the school was not expecting parents to have to teach their kids to cross roads on their own or any other aspects of travelling around the neighbourhood. That stuff the kids were expected to know. Downside to the system is that schools start and finish really early – from what I remember of exchanges, even secondary school kids are on the [normal city] bus home by 1pm unless they are in their final year or so. So it’s set up on the assumption that someone is home all day. I’m 10+ years older than you and even then and with relatively not helicopter parents (strict in some ways, but not helicopter) that moment of clarity arriving at college when you suddenly realize “oh, I can do anything I want now” was still a bit of shocking moment. Still it highlights the point that we don’t transition our kids very well, and I don’t think we have for a long time (generally speaking). For example, seniors in high school should have a pretty good degree of autonomy. Maybe a curfew or similar is appropriate, but updating mom and dad about their every movement shouldn’t be the norm. That being said, Montgomery County needs a reality check. People move to Moco and Fairfax County precisely so that their family can grow up in a safe place. But now public parks aren’t safe? Are libraries safe? When I was a kid in NOVA I used to walk with a friend to get Slurpies at 7-Eleven. The houses in my hometown cost a median of about $450,000. I know that in Bethesda, the homes are pretty pricey, too. I never really thought of Montgomery County as urban. can somebody explain to me which “urban” area of Moco is considered so dangerous? I’m very curious. I feel for you, “free range parents”. Thanks for reproducing, and thanks for trying to inject some freedom into your kids lives. The science behind worst first thinking. A reliable way to make people believe in falsehoods is frequent repetition, because familiarity is not easily distinguished from truth. Daniel Kahneman, Author, and Nobel prize winner. When we see the bombardment of stories about child abduction, we can’t help but to feel a desire to protect, outrage, fear, or all of the above. Even if we know that they’re rare and reported 10,000 more often than they actually occur, we still get those feelings. 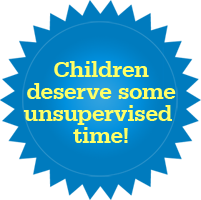 When we see children unsupervised, those feelings surface EVEN if we know them to be silly! Trying to ignore these feelings can be difficult. For months, Pavlov fed dogs and monitored their drool glands. However when he fed them he always rang a bell. After a while, the bell sound would make the dogs to drool. In essence, he taught the drool glands to activate whenever the dog heard a bell. They did this even without food being present! Drooling is not a voluntary response. This involuntary response is the same as your involuntary response of feeling outrage, protective, or fear when you see stories of abducted children. After you see this for a while, the sight of an unsupervised child will bring up these feeling just like the bell made the dogs drool even though the dog wasn’t being fed! I actually thought this was good news. I didn’t know this. I only knew the Meitivs were being bombarded with criticism. I’m glad the’re being praised as heroes as well. On this very site you can find articles about ridiculous library policies related to the great need for parental supervision of kids at the library. These articles resulted in, if memory serves, many comments about homeless people at the library, naughty kids at the library, mean kids at the library, parents who use the library as babysitters, kids who had to had to walk home in the dark after visiting the library. One certainly got the impression from reading those comments that no, libraries aren’t safe! I sent an email to Montgomery County police chief Tom Manger today asking if MCPD could use more discretion with the local family that has caused so many residents to call 911. The chief is out of town but his assistant shard this response with me, which surprised me a bit. Ms. Andrews, based on the story being portrayed in the media today, it is not surprising that you are so critical of our actions in this case. We have released accurate information today, and hope that it clears up the inaccurate story put out by the media. These children were adjacent to a downtown parking garage, not in a park. Child Protective Services has the responsibility to notify the parents. It is mandated by law that CPS determines if it is safe to release children suspected of being neglected back to the parents. This event began when a citizen called 911 to report that 2 children were walking near a parking garage and were being watched by a local homeless man. The responding officer observed the man looking at the kids and decided to take the kids into his custody for safety. Once he determined their ages, he called CPS. All done in abundance of caution. What would you have thought of us if we ignored the 911 call and something would have happened to the children? I have two children. If they were 2 hours late getting home (when they were 6 and 10), I would have been frantically calling the authorities and out looking for them. We got no such call. You are entitled to your opinion about this, but please go to our Website and see our release, which contains factual information about what occurred. Then, review the relevant statutes in the State of Maryland to understand the mandates that my Officers were under. 1) I’m bothered by the fact that a homeless man was automatically judged to be a threat both by the caller and by the officer that filed the official incident report. Since when did being homeless mean that you’re a threat unless proven otherwise? According to the caller and the officer, the man was “eying” the children, but is it so far from the realm of possibility that maybe he was just keeping an eye on the kids to ensure they were okay? This is a copy of a letter Councilmember Riemer ( https://www.facebook.com/hans.riemer?fref=ts ) posted to his FB page. I can’t help but think that this unnamed homeless man was possibly watching the person who called the cops while tailing the kids to keep an eye on them and was thinking “that person seems too interested in those kids. I’m gonna keep an eye on them to make sure they’re okay”. Oh, is that ‘Recall Riemer’ fuel? Sure looks like it! I apologize for posting the above comment twice. I thought I hit the submit button before I left the room for about 5 minutes. When I came back, my comment was still sitting in the box, ready to be sent. Only after I hit it for a second time did both comments appear. Not sure if your comment was directed at me. I don’t even live in Maryland so I have no say in what goes on over there politically. Additionally, other than thinking that it was pretty dumb of Councilmember Riemer to post the original comment on his page without thinking it through, there is nothing in my above post that suggests that Mr. Riemer has done anything other than try to find out what exactly was going on. He reached out to the Chief for clarification and received that letter in response. Kids were described by the caller as the oldest being about 7 or 8 years of age and wearing dirty clothes (though the operator seemed to twist the caller’s observation to make it seem more insidious). I may have missed it, because my son got a little loud playing a game, but I didn’t hear the caller mention a homeless man “eying” the kids. In fact, he even commented that the kids had noticed him and seemed a little frightened that he was following them. What Montgomery County reps are willing to speak up for sanity? Tell me who they are and I will promise help for their next campaign. The councilman’s letter says they were 2 hours late getting home. They were only late because the police detained them. If it was 5pm, they were actually heading home an hour earlier than expected. And the parents did start looking as soon as they were late. Would the police/CPS have been ok with them being unsupervised at the park, as long as the parents took them there and brought them home rather than having them walk less than 3 blocks by themselves? And the 911 call – they had “dirty clothes.” Oh, the humanity! Kids playing at a park actually got dirt and grass stains! And, NOTHING HAPPENED. The neighbors say they have been worried for years about the kids wandering around. Why don’t they take the evidence into account – nothing bad happened to those wandering kids. Except someone whose first instinct was to call the police instead of talking to the children, and then the rest of the government ridiculousness . . . So Silver Spring MD is considered urban now? I think of it as $1-2 M homes, outdoor malls and country clubs. I must have been in the other part of Silver Spring. I wonder what the statistics are for the danger of driving compared to the danger of walking. It could be that it is safer for kids to walk to school than for their parents to drive them. We should also consider the danger to other people from driving or from school busses carrying children short distances. I have been following this on the local news. They are letting their kids be kids, kinda like how I grew up. I had to stay in the “neighborhood” but I could stay out until dinner time. The only reason my parents worried was because a boy around my age had been kidnapped the year we moved into town. (If you saw the movies “I think my name is Steven”, that’s the town we lived in.) They had legitimate concerns, but we were still allowed to walk about half a mile to and from school (with my older brother until he went to middle school then I walked it alone) the local store .. I think it was also half a mile. Heck, we even walked to the near by high school for summer school swimming class. This family is being harassed. The worst part of all this is that there are many children being neglected and abused for real every day. We may all be distracted by this one story and easily forget to notice how poverty, racism, and other forms of systemic violence hurt children. I have neighbors who let their kids run out onto the road, and almost get hit, that in my opinion should be better supervised, but as long as they are taught how to watch out for the dangers, they should be fine. I grew up Amish. We explored the farm. We walked 4 miles home. And we survived. So who appointed this person as official spokesperson for “the neighborhood”? Why not just go back to anonymous letters as witnesses? The letter that replaced this is in many ways worse that the stupid gossip and innuendo. Everyone who agreed or disagreed with the Meitivs the first go round in the media, knew they were different. Some might say “off”. But this letter from the police is more than “off” it is illogical, and factually inaccurate. They were walking home. If it is okay for them to play in a park, alone, it has to be okay for them to walk home from it. Parking garages don’t attack pedestrians of any age. Then CPS needs the responsibility taken away, because they didn’t fulfill it in a reasonable time frame. And what rose to the level of actually suspecting neglect? The fact that they existed in public in a manner common to every prior generation of children (and as the Meitivs and their lawyer contend within the law). Who’s suspicions triggered this? Your later statements indicated the officers didn’t really suspect neglect. So what triggers this hand over to CPS? Dirt on the clothing of children who had just been at a park? The fact that someone called? What if a person with mental issues called every day over the same thing that never yielded any evidence of children in danger? I’ve heard the cops in DC go check it out, see that it is nothing, yet again, and move on. They don’t take children into custody, just because someone called. No I’ve listened to the 911 call. The event began when a citizen called 911 to report 2 younger citizens whom he had seen 20 minutes previous in a park, and who’s ages he underestimated, were now “wandering” which he clarified to mean walking steadily south bound on Fenton street. The caller at no point made reference to a homeless man. But he did report following them for about 3 blocks. And that when the children turned off of Fenton street onto a residential street the children noticed him, appeared nervous, turned back toward the business district, and were in the process of approaching a specific business when the police arrived. It was in the police report that the police noted a homeless man watching the children. Heaven forbid a homeless man exist, or notices children being accosted by police. If you actually had a report of someone scruffy looking dude stalking children (which is not what you had), take the stalker into custody not the people being stalked. You didn’t even question this person you claim was suspected of stalking these children! (Of course the only stalker was the 911 caller you sanctioned to follow the Meitivs). Do you take women into custody when they or someone else report they are being stalked, and let the stalker go? Do you then proceed to tell women who have been stalked that from now on they must have a man escorting them at all times, even in their own homes and yards, and that they will be taken into custody if they are ever found without one? In other words, the officer had no actual concerns about their ability to handle themselves. Just the fact that they are a vulnerable demographic. Just like small women are a vulnerable demographic. Also if the call was made “in an abundance of caution” then the officer does have discretion and prior efforts to hide behind CPS are an excuse. Let’s shift demographic to make what I believe and why, a little more clear. If the cops got a report of a frail looking, possibly senile elderly person, with dirty clothing, wandering the streets, and they didn’t respond and I later heard about it because something awful happened to the individual, I would want to know who was responsible and I would want the person or people involved fired. However, if the police responded, and talked to the elderly person and determined that the individual was not senile had recently been gardening, and was walking around aimlessly to enjoy the neighborhood and the spring weather, and you released the elderly person. And then something awful happened to that person later. I would think it an odd coincidence and a tragedy. If however, after determining the old person was not senile, you pointed to a nearby homeless person, or the 911 caller who had been stalking them on your behalf, claimed they were in immediate danger and that you were going to drive them home and then took them to an Alzheimer’s ward and refused to release them unless their children agreed to never let them walk alone again because you were tired of getting calls about someone who appeared senile. I would want your entire department cleaned out from top to bottom and would want every elected official who defended your actions voted out of office. And If anyone said,(as they say of the Meitivs) that the fact you managed to pick the old person up was proof that the old person didn’t have the wherewithal to walk the streets, I would tell them to get their head examined. In that order? I occasionally didn’t turn up when expected as a child. My parents looked first, and called police only if they couldn’t find me, so as to make sure there was no simple explanation first. Daniel Meitiv’s Facebook page had her reporting at the time that she was out frantically looking for them. I find it suspicious for a parent not to call missing kids in fairly quick. But the police here aren’t beyond suspicion. You didn’t keep your facts straight about the 911 call or the homeless man, or if they were in the garage or near the garage. CPS has used your office to threatened to these kids away before… do you expect these parents to feel safe calling you? Furthermore you also stand accused of having an officer who threatened to shoot the father if he didn’t immediately find his ID, because he dared ask why he needed to show ID, and then he says the officer entered his home without a warrant and refused to leave. But the Montgomery County police didn’t even announce an investigation of these very serious allegations. So again, do you think they feel safe calling the police? I’ll add one brief supposition, a very prevalent attitude the last time this was in the media was. “If you ‘free-range’ parents want to raise your kids that way, FINE! But don’t come crying to the authorities to find them if they go missing. If you won’t watch them they aren’t our responsibility.” Are you absolutely sure no one in your department or CPS said anything like that? Because the un-chalenged, un-investigated allegations indicate that you aren’t bothered if your officers might be violating the constitution and threatening to murder citizens in their homes. What’s a little don’t come wining to us? Yes we are, and in other obvious news, people with opinions vote. People with opinions also decide if they should dial 911? Who is going to call 911 on a suspicion if they don’t trust your judgement? Who will call 911 on a concern if they believe you are so bound up by regulations that you aren’t in a position to sort things out? How will you keep the citizens safe if children fear you and people see something, and say nothing? I have reviewed this note, the 911 call, and the police report. And I find the 3 don’t line up. As the Washington Post clearly states “In the 911 recording, the caller at one point mentions the children near a parking lot, but they do not appear to be in a parking garage, as a police description Monday seemed to suggest.” In reviewing the call I also find that the children behaved most rationally, and capably, in deciding to head back toward a business in the busy business district. Adults are regularly told to get to well lit and trafficked public place if they feel unsafe. Why is this forbidden to our younger citizens? The children also appear to have headed around the building when the police showed up. Which, while this is not desirable behavior, it is likely a rational response to having seen police threatened to murder their father, and be used by CPS in a threat to take them from their family. Well the law about supervision speaks only of children who are confined and doesn’t address the outdoors, thus the lack of charges after the last incident. That part is clear to most of DC by now, it should be clear to your officers. But even accepting the broader application it applies to children under 8. So why wasn’t 10 year old Rafi allowed to go free, or at least returned home? Or was he just held to prevent his parents from finding out? What statute prevents you from phoning the parents? What statute forces you to pick up kids that your own officers have determined aren’t in danger? What statute is elevating CPS’s opinion above the carefully worded law passed by the legislature? Empower Kids Maryland wants the law changed, but hasn’t figured out what is causing all this. In the interest of open government, can you answer what laws have stripped your officers of the ability to engage the public (or at least those under 18) with appropriate discretion? So these parents are so irresponsible to let their young children walk a few blocks on their own and this caller felt compelled to call the authorities. Well, if safety of children to this extent is so darn important to the neighbors or anyone else lets take some examples of other parents that should have the authorities called on them. A parent lets their 6 year old son play football. It is a proven fact that the chances that child will end up with an injury is almost guaranteed but the parents stand there and watch it happen. It is proven that there is major brain damage that occurs in this type of sport. So call the cops on all the parents that let their kids play football; law should be no child can play a sport that may come to injury until that child reaches the age of 18 where they can make their own decision to injure themselves. How many parent force their child to play football when they really don’t want to. Humm!! Is that child abuse. Child calls CPS and complains that his father and mother won’t let him quit the football team because he is scared he may get hurt. Oh, but it is supervised. How many kids get hurt playing football even when adults are standing right there. What about parents that let this young children handle a weapon when hunting. Put the child in danger of being in the woods with idiots out there shooting at whatever moves. Oh but the child is with an adult. One wrong move by the child or even an adult and the gun goes off by accident. Kids don’t mature until they are 25 but put a 16 year old behind the wheel of a motor vehicle which can be used as a killing machine if not handled properly. So those of you who believe that 16 is too young for a child to drive; then you should call the police or 911 when you see a 16 year driving a car. Lets take things in perspective may we please. We all have our levels of what we feel is safe or not safe for a child especially when it is yours. You child may be more mature at the same age as another so therefore you feel he or she can handle a weapon at a younger age or your child even though he or she is 17 is not mature enough to drive a car yet. You as the parent has to make that decision and guide your child as you see fit. You can pass judgement on other parents just because you don’t agree with something they do or believe in. When I was 9 back in the early 60’s i rode the public bus in the Bronx in New York to go to my piano lesson. I rode the subway at 10 to go bowling with my friends and to have pizza and pop. I was a very responsible kid and my parents knew it. My friends and I never had any problems. We would be gone for most of the day. Taking a day with my friends at 10 and just playing outside all day long by ourselves and having a blast was the way to play. Did times get worse for kids now being out by themselves or are the same dangers out there now as there were back in the 60’s but we just get too crazy about a kid getting a “boo-boo” on their knee more so now than before. And there we crazy people in the world back then just like there are now. If we keep this pace up the kids won’t be allowed out of the house at all. Even accompanied by their parents because a new law will state that a particular parent has no right to decide for thier child if something is safe or not. Look at Ireland. The government now assigns a guardian to every single child in the country to over look the parents to make sure they are doing their job as parents. Is this what you want to happen here. You want the government being able to make a final decision in the aspects of how you raise your kids on every matter? It will get there but until it happens and hits some of these helicopter parents in the face they won’t even see it coming. Havva, you knocked it out of the park again! I would like to add, that the 10 yr old that people are saying is not old enough and cannot be responsible enough to care for his sister, did just that. First the caller informed dispatch that they had stopped and asked if they could pet his dog. That is what a responsible child does. The officer offered his lunch, nice of him, and the brother politely declined because of food allergies. And taking that further, I doubt big brother would have left his sister alone with the police. The biggest conflict in all this for me is when they say the police and cps were following procedure. Which is procedure, the police taking them home like the first incident, or detaining them without contact this time? This family should not move. I think it is great that they are standing up for there rights and not giving into the bullying from people who should be protecting families instead of harrassing them and causing people harm. This family is the catalyst we need to fight back. I would fight if this happened to me. I’m not one to be bullied. Lets see where this battle leads. Don’t give up Meitiv family! When I started university, they did a separate orientation session for the parents. I wasn’t there, but may parents told me it was basically, “Your kids will be fine. You’ve raised them to this point where they’ve gotten into university, so you’ve done a good job. If they come to you with problems, tell them how to fix it using the correct university resources. Here’s the list of those resources. Now, go home.” I actually wanted my parents to leave when they dropped me off the first time, because I’d just spent the whole previous day in the car with my whole family, and then we stayed overnight at a really sketchy motel, and so, when we arrived, got me moved in, did the tour, and then returned to my room, I had with me a laundry bag with the Bishop’s University logo on it, with a variety of “welcome” goodies–a plastic mug, because glass wasn’t allowed in common areas, a Frisbee, because Ultimate Frisbee was a big deal there, and a colour-coded T-shirt, matched to my residence hall, to be worn to the students-only orientation session, and the barbecue afterwards. So, we came back to the room, and my mom said I should change into my shirt, and I said, “Okay, I’ll put it on in the bathroom” (the residence was bog-style, so it was all single rooms, with a tiny bathroom between every two rooms), and even though I didn’t exactly mean it as a hint that they should leave, I kind of realized it as I was saying it, because at this point, my whole family was in my room, plus a few of the other girls on my floor, who’d all run into my room to greet me the moment I’d arrived. I think they got it, though–I’d arrived, been on a tour, gotten settled, and was beginning to make friends, so their work was done, at least for the time being. The following year, I met a girl who was going to be my neighbour/bogmate (whose name was ironically also Emily), who had a total meltdown when her parents went to leave, and then she ended up transferring to a different university, to be closer to home. The year AFTER that, when I was living in the on-campus apartment building, one of my housemates’ parents stayed for HOURS, until every last J-Cloth was moved in……which was kind of strange, because it was customary for returning students to either arrive at school without their parents if they had their own transportation, or to just be dropped off quickly if they didn’t. As for the “we can do whatever we want” mentality, yeah, I saw a fair bit of that, but I ended up being mostly okay, because I wanted to go to my classes and learn. Thanks. And Warren, I agree with what you noted about Rafi Meitiv. It did occur to me that he probably wouldn’t have left his sister even if he was given the option. My sister and I fought like mortal enemies growing up, but when the chips were down we stood together like one. When the whole group was going out and got in a car accident, none of us had given huge thought to notifications. And still about a dozen people raised the alarm that we were missing. Lets just say male engineers are very protective when a large proportion of the female engineers go missing. We learned that people with friends and active social lives have a hard time going missing. And eventually I processed that I was no longer in a rural area where it was possible to wind up in a ditch, or over a cliff without being noticed. I don’t usually defend cops, but is it not an either or here. The police very often have different procedures for dealing with repeated “offenses.” I’ve had many cases where the police were called out on a first domestic spat and just told one party to go spend the night someplace else, but the second time they were called within a short period of time arrested someone. Cops are not actually bound by “you must do X every single time Y occurs.” They are allowed some discretion. I find it interesting that you are so opposed to zero tolerance rules, but seem to demand that police have one way and only one way of ever dealing with a particular situation, which is in essence a zero tolerance rule. @Havva – Wonderful replies 😊. About the college thing – I’m not sure that parents expecting you to tell them where you are going and when they can expect you back is helicoptering though. I always ‘logged’ basic plans in with my parents, and that was in the 70s. While I was flatting with various groups , from age 17 through to 27, we also generally let each other know where we were going. Just seems like common sense, rather than a restriction. And that transition is always going to be abrupt, I think. I remember it being like the rest of my life had suddenly arrived, and I was not prepared for it😊. (Actually, legally I wasn’t prepared for it, as I was too young to sign for much of the stuff I had to, which was a PITA and required more parental input than was good for me at the time, but that’s life 😊). My mother noted that she felt the same, when dropped off at nursing school in the 50’s. I too will be dropping my kids at the airport and allowing them to face moving into dorms on their own….the last thing they need is Wally Mum projecting her neuroses on them 😊. That is if any of them do that…living in the capital, there are too many tertiary options to get rid of them to other cities. Might be time to move to the boonies 😊. I’d never heard of free-range parenting until this morning when I heard Lenore on Wisconsin Public Radio. She was brilliant. Well-spoken, funny, sly, and gracious. Well done all the way around. I grew up riding my bike from age all over St. Louis County. I mean everywhere! It wasn’t free-ranging–it was being a kid! This is nuts. Keep up the fight folks–glad my kids aren’t young enough to have to deal with this sort of nonsense any longer…. I grew up riding my bike from age 8 all over St. Louis County. I mean everywhere! It wasn’t free-ranging–it was being a kid! This is nuts. Keep up the fight folks–glad my kids aren’t young enough to have to deal with this sort of nonsense any longer…. My sister taught me how to swim when she was 7 and I was 3. She taught me how to cross a road safely. That should be a fundamental role of siblings, in my opinion.